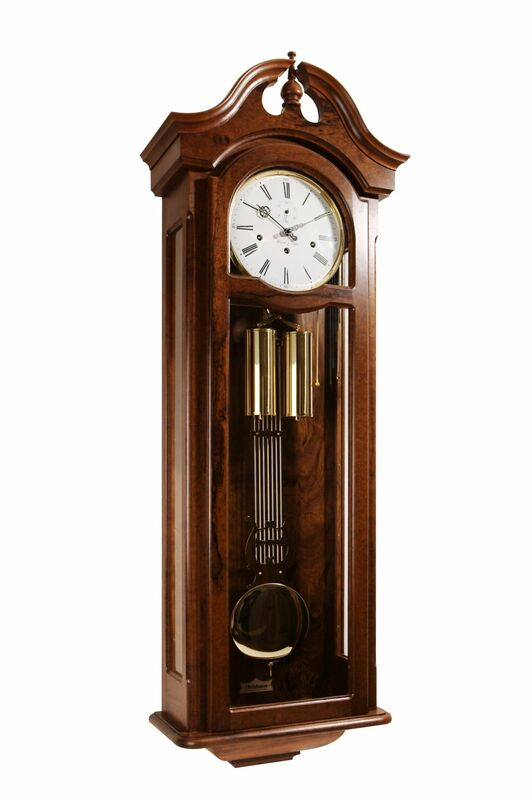 This wall clock features a high swan neck crown and no side columns. This allows for a smooth and particularly eye-pleasing design. This clock is pictured in Brazilian Walnut, a timber well known for its complex hues, making it a favourite in the crafting of pianos. Side glass panels allow light onto the cable driven 8-day mechanical Hermle movement, which has a brass aluminium wishbone holding two weights that drive the time. This movement plays the Westminster melody and has an automatic night silencer option.